The world is white outside and all my recent spinning has been white, too. So last night a strong urge for color had me pulling a lovely silk cap apart that I bought at SAFF last fall. The vendor didn't put a name on the receipt (hint to all you vendors; they would have gotten a link!) so I don't know who I got it from. 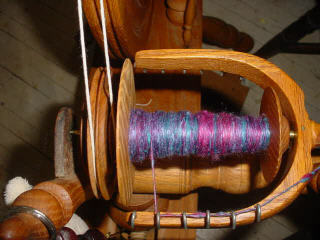 It's spinning nicely and I'm thinking of using it in a different kind of spinning project. I'll let you know if it works! Finished plying the pound of Coopworth for the walnut dye pot and got it heated up last night. The stuff didn't smell as bad once I took the hulls out. The skeins have been sitting; as soon as I get a few chores done I'll take them out and see how it worked. There was a flock of crows under the bird feeders when I got up. I have some old bread I'll take out, in the hopes of distracting them from my expensive seed for the little birds. It's very cold out; 14 degrees first thing this morning and some snow was falling before daylight. Now the sky is very clear and the sun is bright on the snow. Warming slowly. The dogs dashed out and then back in and I haven't seen a whisper of a cat, but the birds are twittering anxiously in the shrubs by the feeder. Time to hit the chores!